I did not realize how amazingly fast a hare can run. I watched two dogs chase a hare across a snow-covered field. The dogs were vastly outclassed. Now, I am not a fan of dogs running free in the Park and chasing wildlife, but on this occasion, the dogs provided me with a scene and a picture that would have otherwise been difficult to obtain. As my camera had been accidentally set to 1/4000 of a second, the action in the only shot I managed was unblurred as the hare sped out of the frame. This experience offered me a few firsts. It was my first view of a Snowshoe Hare in its white pelage. And while I had seen a hare bound across a field before, this is the first time I had seen one running for its life — it was impressive. Then there is the stance the camera caught just as its large hind paws swung in front of its forepaws. 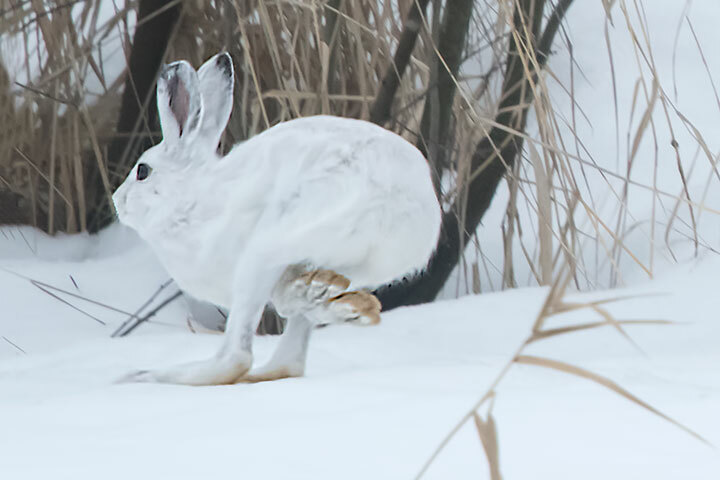 A Snowshoe Hare in its white pelage speeds across a snow-covered field. This entry was posted in commentary, mammals. Bookmark the permalink. Some people make me sick allowing their dogs to chase animals and birds. This type of person should put themselves out to be chased by a wolf or a cougar & see how it feels. I have owned many dogs over the years & have never allowed this behaviour, I am prouder to have a well trained dog who obeys all commands either verbal or hand commands than have a bully type dog that listens to nothing. Smarten up people!!!!!! I love seeing their tracks in the snow, as I did this past week. Saw this one during summer munching on grass along Arena Avenue, in its summer “plumage”…lovely critters, if they don’t get into your garden! Thanks for the beautiful shot. Outstanding photo. I always carry an alpenstock or cane — mainly for the stability, partially as a unipod for the camera, but also for the not-so-friendly dogs I’ve encountered.